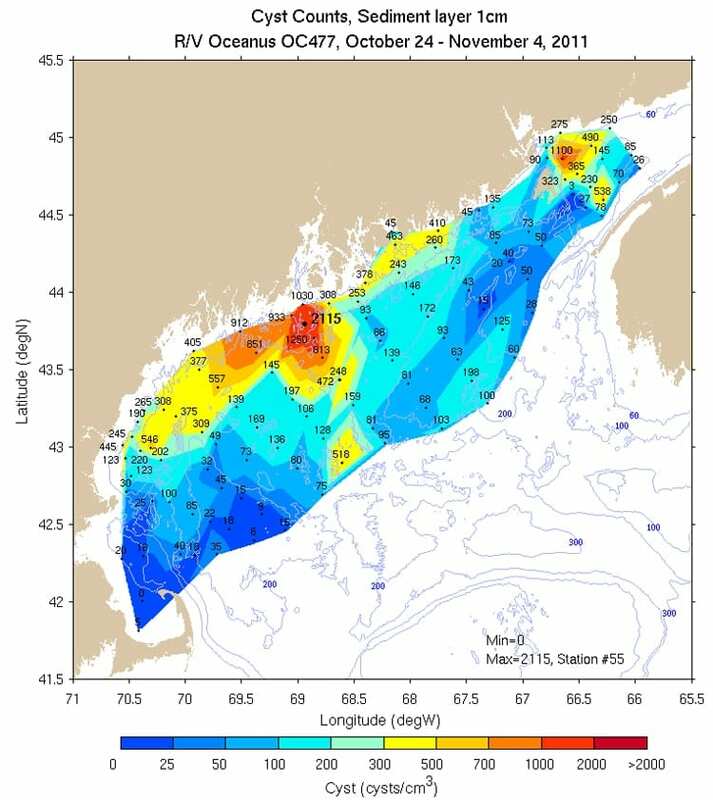 New England is expected to experience a “moderate” regional “red tide” this spring and summer, report NOAA-funded scientists working in the Gulf of Maine to study the toxic algae that causes the bloom. The algae in the water pose no direct threat to human beings, however the toxins they produce can accumulate in filter-feeding organisms such as mussels and clams— which can cause paralytic shellfish poisoning (PSP) in humans who consume them. Under a newly developed rating system, a moderate bloom could cause the closure of shellfish beds along an estimated 126 – 250 miles of coastline. The 2012 outlook is based on the quantities of the algae Alexandrium fundyense in its dormant – or cyst – state detected in Gulf of Maine sediments last fall. These data are combined with computer simulations that model a complex range of meteorological and oceanographic conditions — winds, sunlight, rainfall, tides, and currents — that impact the size of the bloom. “Our goal over the last ten years has been to develop a system to help the shellfish industry and environmental managers better plan for the annual bloom,” said Woods Hole Oceanographic Institution (WHOI) biologist Don Anderson, who has worked with WHOI colleague Dennis McGillicuddy and North Carolina State University (NCSU) Prof. Ruoying He to develop the computer model to help predict the intensity and location of blooms. Scientists are unable to make a precise forecast of where and when the regional bloom will make landfall because bloom transport depends on episodic weather events and currents that cannot be predicted months in advance. Rather, the scientists use the computer model to produce a range of bloom scenarios – or an “ensemble forecast” – tracking variables like wind direction and water characteristics based on previous years’ conditions. This is similar to the system used to forecast hurricanes. A number of factors could impact the forecast. For instance, changing characteristics of water in the Gulf of Maine can have a direct effect on the growing conditions for Alexandrium. Wind direction imposes another uncertainty to the forecast. For example, strong northeast winds in the spring and early summer drive the bloom inland toward coastal shellfish beds. In contrast, when southwesterlies dominate, the algae tend to stay offshore. “Each year, we add another set of environmental conditions to our archive of model runs. In the future, a winter that is warmer and drier than normal can be represented by 2012, but right now, we have no similar year in that archive,” said Anderson. In order to protect public health, shellfish beds are closed when toxicities rise above a quarantine level, often during the peak harvesting season. Due to effective monitoring by state agencies, there have been no illnesses from legally harvested shellfish in recent years, despite some severe blooms during that time period. There have been, however, several severe poisonings of individuals who ignored closure signs. The economic impacts of PSP toxicity are significant in the region. Direct and indirect costs of the extensive Alexandrium bloom in 2005 were estimated at nearly $50 million for Massachusetts and $23 million for Maine. The 2012 designation of a “moderate” bloom now has a specific, quantifiable meaning, thanks to a complementary research effort by Anderson and his colleagues to develop forecast terminology to describe a bloom’s potential impact. As part of that work, Judy Kleindinst, a member of Anderson’s team, analyzed records of harvesting closures due to PSP extending back 35 years, and identified three categories of bloom severity. The categories — “limited, “moderate”, and “extensive” – are equivalent to closures over 0 – 125, 126 – 250, and 251 – 375 miles of coastline. 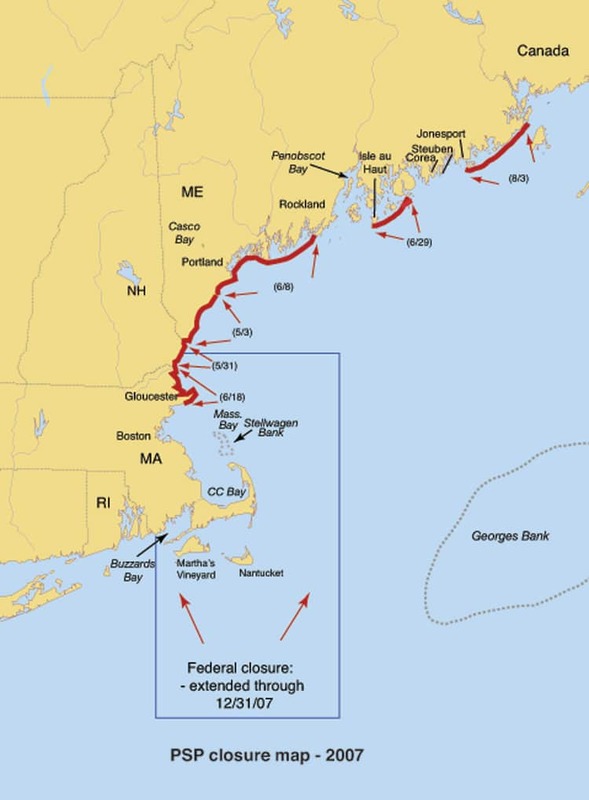 A moderate outbreak might stretch from Maine to northern Massachusetts, although it could be shifted down the coast, covering the same length of coastline, but over a different area. When combined, the forecast terminology, the annual cyst surveys and the continual improvements and additions to the computer model have developed into a useful management tool. Project researchers regularly share their field observations and models with more than 80 coastal resource and fisheries managers in six states as well as federal agencies like NOAA, the EPA, and the FDA. Real-time forecasts are updated on a weekly basis and additional information will be provided on the “Current Status” page of the Northeast PSP website, particularly as new information becomes available from coastal ocean observing systems such as the Northeastern Regional Association of Coastal Ocean Observing Systems (NERACOOS), EcoMon, and AZMP. The National Weather Service is also providing extended hydrological and meteorological outlooks to accompany the bloom forecasts. The forecasting project is a collaboration of investigators from NOAA’s National Ocean Service, National Weather Service and National Marine Fisheries Service, WHOI, NCSU, University of Maine, the FDA, Maine Department of Marine Resources, New Hampshire Department of Environmental Services, Massachusetts Division of Marine Fisheries, and the North Atlantic Clam Association. Funding is provided through the NOAA program Prevention, Control and Mitigation of Harmful Algal Blooms (PCMHAB). 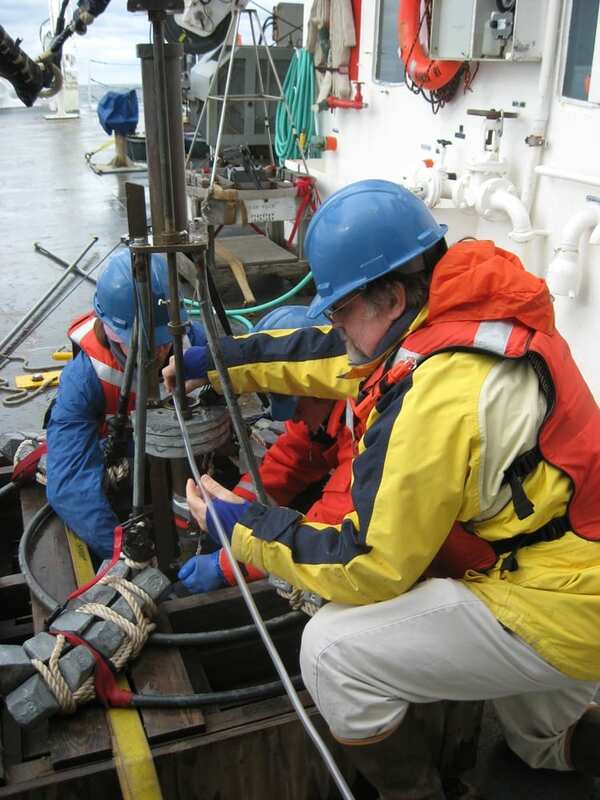 Longterm support for Alexandrium studies in the Gulf of Maine is provided by the NOAA NOS Center for Sponsored Coastal Ocean Research (CSCOR) and NIH and the NSF through the Woods Hole Center for Oceans and Human Health. 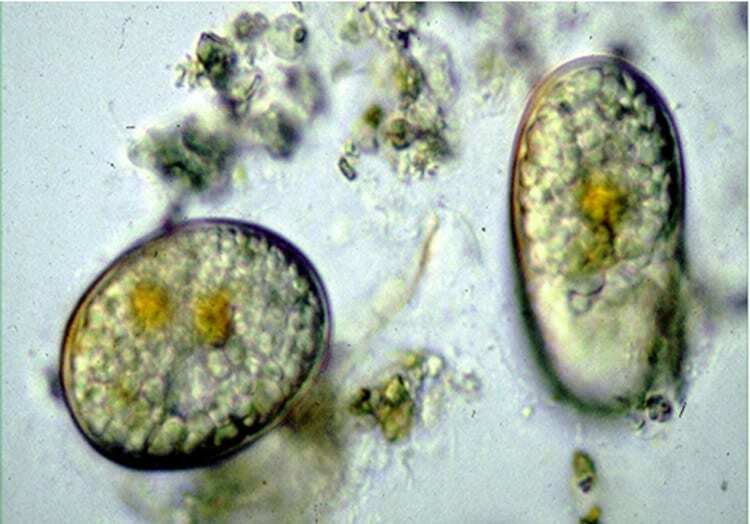 Harmful algal blooms (HABs) in the Gulf of Maine are caused by the dinoflagellate Alexandrium fundyense. In the early spring, this organism leaves the seafloor sediment as dormant cysts germinate or "hatch," swims toward the surface, and divides again and again to form a “bloom” or red tide. 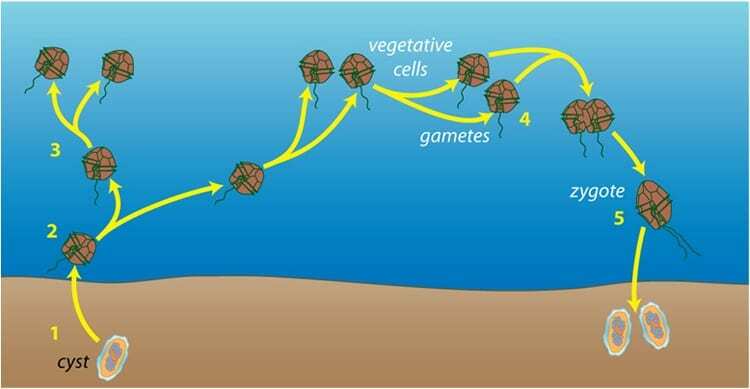 As the bloom ages, new cysts are formed that fall to the ocean bottom where they remain until they germinate the next year to restart the process.